One of the great honors of working in the marketing agency world is seeing your work recognized. For me, an even greater honor is seeing the work of our clients and my team recognized and that’s exactly what happened at the 2018 Killer Content Awards. This year the award in question went to our client Cherwell Software. Thanks to amazing work by Alison Munn and the Cherwell Software team (pictured above), as well as our team at TopRank Marketing, their integrated influencer content program drove 22% of all new sales pipeline revenue in 2017. 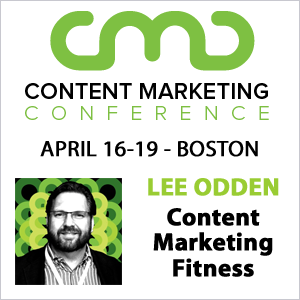 But this post isn’t about just one B2B content marketing story. It’s about 32 stories from an impressive collection of B2B brands. These award winners are case studies for content marketing that we can all learn from. 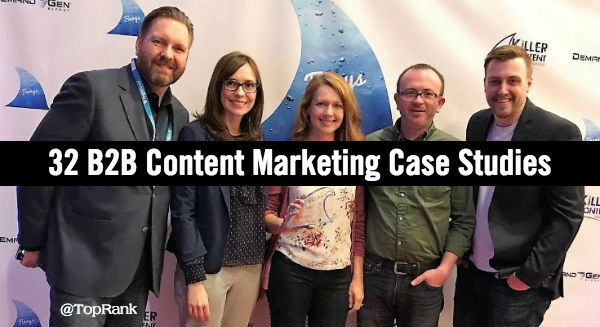 A BIG THANKS goes to the team at B2B Marketing Exchange for sharing raw case study data and both Anne Leuman and Lane Ellis from my team at TopRank Marketing for their collaboration on word-smithing the content and capturing the images of this post. 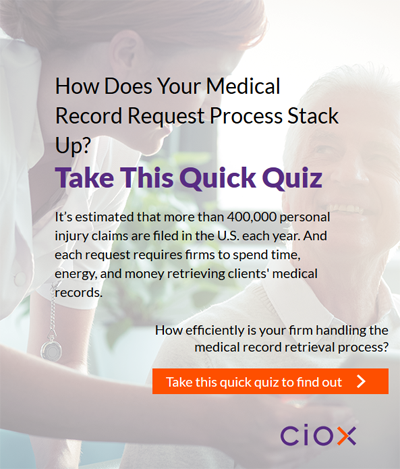 Project: Ciox Health partnered with Content4Demand to uncover new growth opportunities with target audiences (e.g. law firms). After creating detailed personas, they developed highly tailored content messaging for all stages of the buyer’s journey. The final campaign featured an infographic, interactive quizzes, interactive listicles, checklists, Q&A sessions, and mixed media video. Project: Equifax developed a multi-touch campaign consisting of more than seven touch points, including emails, social posts, blogs, webinars, and promotional emails. Quarterly webinars were the centerpiece of the campaign, allowing Equifax to capitalize on existing economic trends and CreditTrends reporting that were relevant to their target audience. 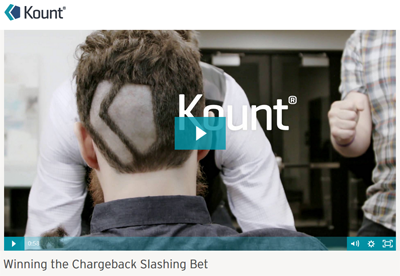 Project: The Kount team, a provider of award-winning anti-fraud technology, created the Fraud360 worldwide tours, regular webinars, and video ads, which were designed to provide market-specific content and tailored insights that focused on specific trends and industries. Project: In order to prove its knowledge of buyer pain points and the effectiveness of its solutions, Xactly rolled out the Power of X campaign. Using customer testimonials and product demos, Xactly strived to nurture existing relationships and drive demand through an integrated, buyer-focused campaign across all segments, featuring a landing page hub, social promotion, direct mail, customer videos, and webinars. 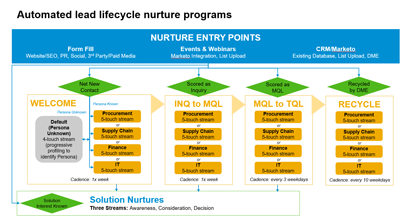 Project: SAP Ariba wanted to create a complete lifecycle nurture program for each of its targeted personas: Procurement, Supply Chain, Finance, and IT. 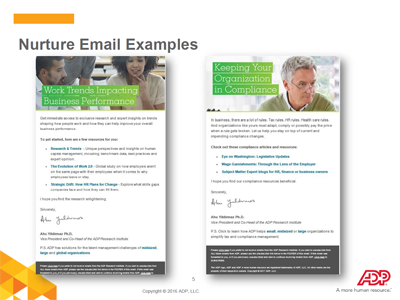 Working with DemandGen, SAP Ariba mapped all 80 emails appropriately and used non-promotional language to emphasize their “thought leadership” content. Project: To identify potential buyers and convert readers into sales opportunities, ADP developed a flagship Research Nurture Program. The program leverages website analytics, marketing automation, and scoring to identify key buyer personas, customize content, and send nurture emails for longer-term engagement. Project: Bottomline Technologies breathed new life into its quarterly awareness email campaigns by introducing themes that aligned with pop culture events. By making subtle tweaks, the company was also able to create relevant messaging for different lines of business (e.g. strategic finance, controller, accounts payable), including infographics, white papers, and checklists. 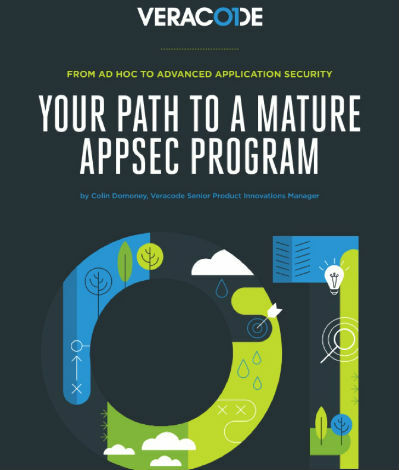 Project: Veracode created the Application Security Program Journey multi-touch campaign to drive awareness and generate demand for application security. The integrated, multi-touch campaign consisted of various content mapped against the buyer’s journey, as well as multiple inbound and outbound promotional tactics. Project: To promote the launch of its new brand, OptumIQ, Optum created Data In Focus, an event to attract decision makers and influencers in person and via a livestream. Over a six-week period leading up to the event, the company unveiled key event details via an integrated campaign utilizing email, paid and organic social, digital advertising, retargeting ads, direct mail, and more. 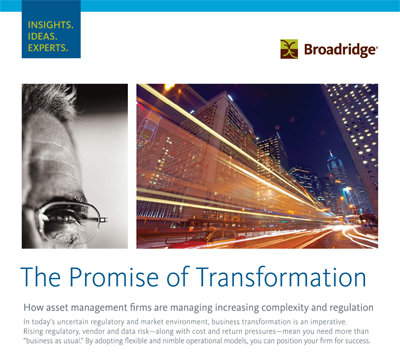 Project: With a sales cycle that can be quite lengthy, Broadridge sought to create a campaign that would steadily educate target buyers — finance executives and operations/IT leaders — on their value proposition. The full-funnel campaign included interactive infographics, eBooks, executive briefs, and Q&A’s that addressed buyer pain points. Broadridge paired this campaign with an internal guide to educate sales on the campaign goals, individual assets, and follow-up conversation starters to ensure quality interactions with buyers. Project: The Growth and Future of Industry campaign from Grant Thornton was created to help business leaders understand ways to accelerate growth and manage disruption. With over 60 pieces of content and an extensive social media campaign, it is the single biggest research program and thought leadership campaign the company has ever undertaken. Grant Thornton also leveraged paid media — a first for the company — to improve campaign reach and visibility among clients and prospects. 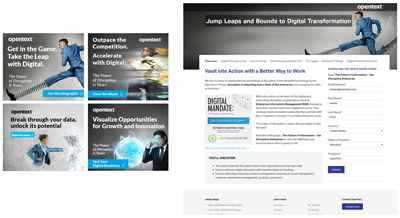 Project: The OpenText Digital Disruption thought leadership campaign was launched to engage enterprise executives in a fun and engaging way as they strive to understand and embrace digital disruption. The campaign used a re-designed microsite to house a variety of assets with a fun superpower theme, allowing visitors to easily consume content — even binge it all in a single sitting. Project: Cherwell Software partnered with TopRank Marketing to develop a comprehensive influencer program for the IT service management industry. 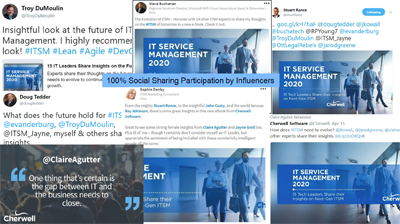 A 24-page eBook called IT Service Management 2020, kicked off the campaign, featuring influencer opinions about the future of the ITSM industry. To generate pre-launch interest, Cherwell produced and promoted several blog posts, an infographic, and co-hosted a webinar with the influencers. Project: Paycom collaborated with best-selling author, keynote speaker and futurist Jacob Morgan on a series of content to give HR professionals a closer look into why employee engagement scores are at an all-time low despite increased employer investment. The campaign featured a two-part podcast, a webinar, and a series of thought leadership blog articles — all featuring Morgan. 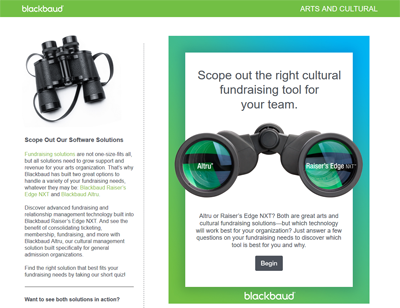 Project: To differentiate the company’s two fundraising solutions, Blackbaud launched their Choose Your Solution campaign. The campaign featured an interactive quiz to help arts and cultural organizations identify the right fundraising solution based on their needs, and to help qualify leads faster and bypass repetitive introductory questions asked by sales reps.
Project: Uberflip created an interactive marketing maturity assessment and companion eBook that asked marketers to take a hard look and identify where they stand in their marketing path. The assessment enabled Uberflip to provide their sales team with better MQLs and gain more information about existing accounts. 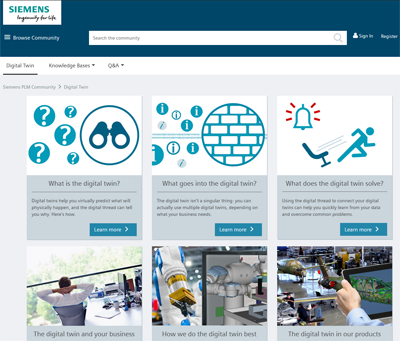 Project: To educate customers and prospects on digital twins and digital threads, Siemens PLM Software created a thought leadership initiative. This initiative included creating a series of blog posts answering common buyer questions on digital twins and threads. 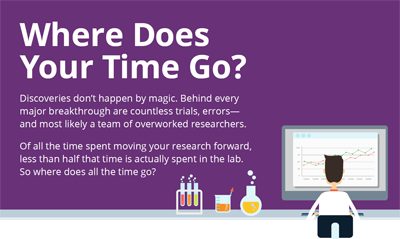 Project: In order to help scientists and research leaders at research and development organizations define important problems and highlight the opportunities additional time could give them, CAS, a division of the American Chemical Society, developed the Where Does Your Time Go? infographic. 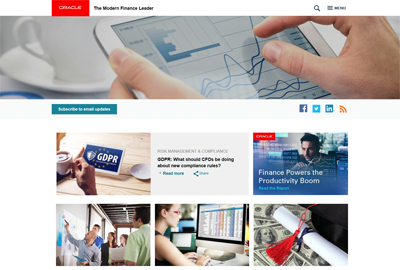 Project: Oracle developed The Modern Finance Leader blog series to establish itself as a leader in the world of finance. The blog targets finance executives across North America, EMEA, and APAC and provides content designed to educate and inform the audience on the latest trends and topics in finance. 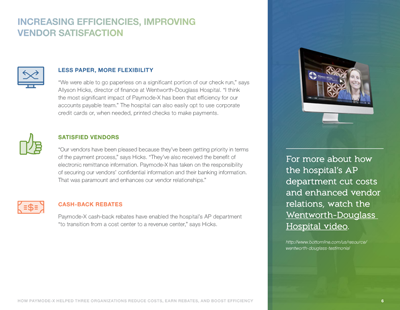 Project: Bottomline Technologies partnered Content4Demand to develop an interactive eBook designed to showcase how three organizations — from manufacturing, healthcare, and property management industries — used their Paymode-X network to elevate efficiency and improve their bottom line. Project: Anthem Blue Cross and Blue Shield collaborated with Skyword to revamp an existing piece of content, titled: The Benefits Guide. In response to new audience needs, Anthem pivoted the asset away from the Affordable Care Act (ACA) focus and replaced it with a newsroom that conveyed news and decisions relevant for plan holders. Project: SAP launched its #LifeAt video campaign to highlight their many innovators, game-changers, and true entrepreneurs, but SAP also sought to humanize the brand for its target audience. The SAP team partnered with the video marketing agency Aftermarq to produce video stories of SAP SMB clients of varying lengths. Project: LinkedIn’s Live with Marketers campaign is a live talk show by marketers for marketers, designed to resolve pain points around top-of-mind topics such as marketing attribution, ROI optimization, and driving business impact on social media. Project: MATRIXX Software designed its 150 Points of Opportunity campaign to differentiate their content from that of their competitors, while also showcasing how their product delivers value to customers. The campaign featured a 44-page eBook and five standalone videos. Project: Tempur Sealy Hospitality was looking for a way to present their high-quality mattresses to B2B buyers in the hospitality industry without having to lug around a physical sample. The company worked with The Mx Group to create an interactive mattress cutaway tool that allowed sales reps to digitally present and sell various mattresses to hospitality customers online and at industry trade shows. Project: In an effort to re-engage lost opportunities and give the sales team more prospects that were more likely to convert, LookBookHQ created their Caveman campaign. The campaign consisted of an interactive digital experience built on the LookBookHQ platform, a direct mail component, and follow-up email outreach from sales. 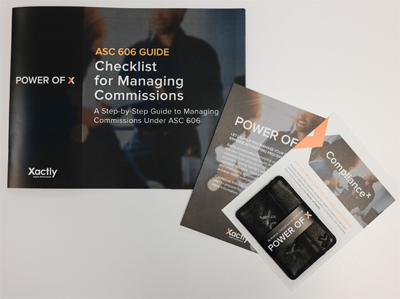 Project: ChannelAdvisor decided to create two unique ABM campaigns that targeted strategic accounts via direct mail. The two campaigns provided over 250 prospects with pre-loaded Amazon devices, featuring ChannelAdvisor skills and apps that educated prospects on e-commerce strategies that were relevant to them. Project: Trapeze Group kicked off an ABM pilot with the objective to identify top accounts with which to deepen engagements and create personalized one-to-one messaging and campaigns — ultimately influencing closed-won opportunities. The ABM pilot has since been rolled out to 60 target accounts. Project: To drive awareness for the company’s new product, GRC Spotlight, Harland Clarke created the “Keeping Up with Kevin” campaign. 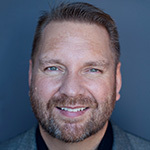 The star and subject matter expert for the campaign, Kevin Malicki, participated in video blogs that were shared over social media — primarily LinkedIn — to help deliver tips and real-world scenarios in the GRC space. Project: Ipswitch created the “Defrag This” podcast and blog to help provide a trusted knowledge base for IT professionals that offers audience-centric content via social channels. Project: Radius’ Revenue Ops campaign was designed to help educate prospects in marketing and sales operations on how their role in B2B business is evolving — from simple execution to providing data and insights to help drive revenue. The campaign was fueled by an eBook that Radius co-created with companies such as Heinz Marketing, Engagio, Forrester, and more. Project: Emma wanted to learn what makes today’s marketers tick, as well as promote collaboration and learning within the community. The company surveyed roughly 200 marketers and interviewed more than 25 industry experts to gauge the goals, concerns, and pressures facing marketers, then compiled the data into its first Email Marketing Industry Report. Themes of success from this collection of B2B content marketing examples include: data informed personas, personalization, interactive content, integrated content, thought leadership and influence. 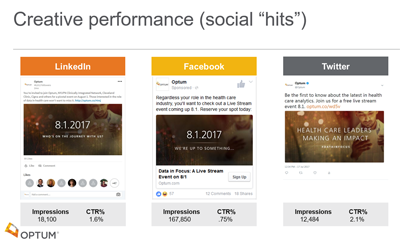 Of particular note was the use of live video by LinkedIn Marketing Solutions. As interactive content has become a more common feature in award-winning B2B content in 2018, I think video will take that spot in 2019. There’s a lot to learn from with award winning content marketing programs and I congratulate all the B2B brands that brought him Finny’s this year. The awards give recognition to great work and they also give us a look inside what’s really working in the industry. Have you noticed a B2B content marketing campaign this year that was remarkable? If so, please share in the comments why you thought it was special.